It is used to select multiple values from given options. It is useful when we want to take multiple user inputs from a collection. 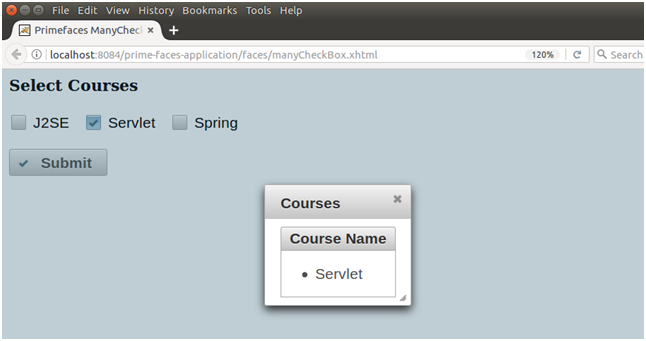 We can use <p:selectManyCheckbox> component to create SelectManyCheckbox in JSF application. It has various attributes that are tabled below. value null obejct It is used to set value of the component. layout lineDirection String It is used to set layout of the checkboxes. columns 0 Integer It is used to specify number of columns in grid layout. tabindex null String It is used to set position of the component in the tabbing order. The following table contains structural style classes for SelectManyCheckbox. .ui-selectmanycheckbox It applies on the main container element. .ui-chkbox It applies on the container of a checkbox. .ui-chkbox-box It applies on container of checkbox icon. .ui-chkbox-icon It applies on checkbox icon. Here, in the following example, we are implementing <p:selectManyCheckbox> component. This example contains the following files.